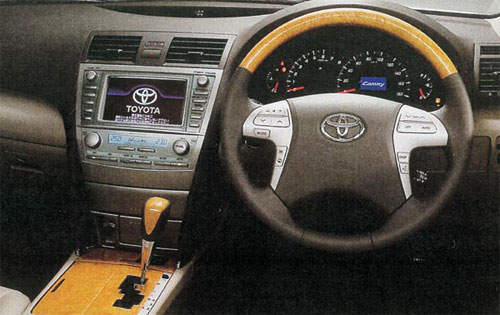 Here’s a sneak preview of the latest Toyota Camry due in 2006. This is the Japanese/American model, so it’s not 100% sure that we’ll get the exact body styling here in Malaysia as even currently the USDM/JDM and ASEAN models are different. Our Camry is less sporty. 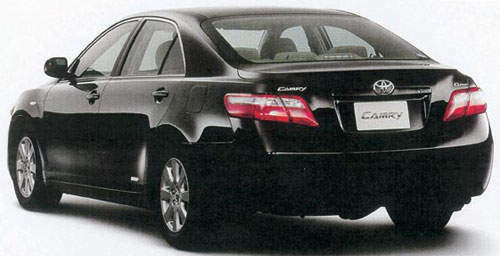 UPDATE: The new 2006 Toyota Camry has been sighted in Malaysia. Click here. The car has received alot of strong lines to it, to make it look a bit more muscular. It look ALOT like the current Honda Accord available on our roads. 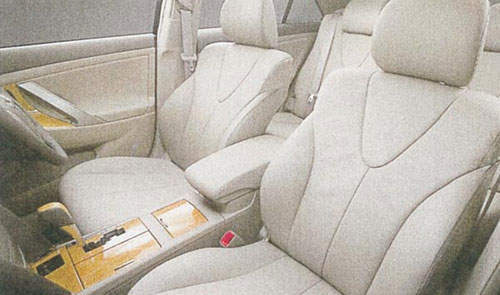 The new 2006 Toyota Camry is 4815mm long and 1470mm tall. That makes it actually 20mm lower than the current model, which should increase it’s handling capabilities. The car is powered by the 2AZ-FE 4 cylinder 2.4 litre engine with a few enhancements over the previous model. The cylinder block has been updated, and there are some changes to the exhaust system. This results in a small increase in the engine output from 158hp to 167hp. The car now comes with a 5 speed Super ECT gearbox. There is also a 4WD model. 2007 Toyota Camry coming soon! Next Post: A timeless beauty.